NEW DELHI — India's Supreme Court on Friday lifted a temple's ban on women of menstruating age, holding that equality is supreme irrespective of age and gender. 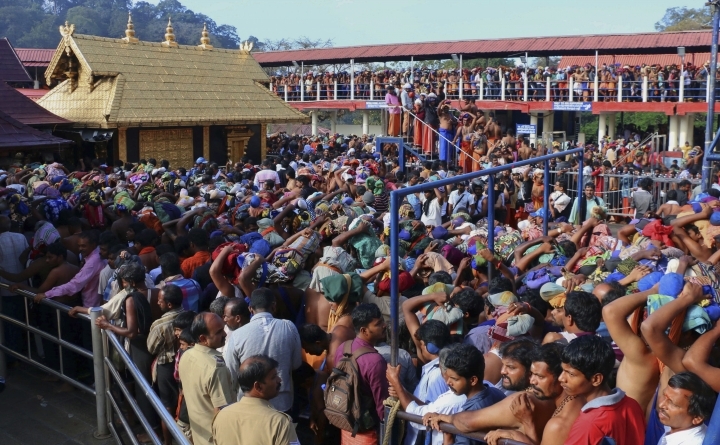 The historic Sabarimala temple had barred women age 10 to 50 from entering the temple, one of the largest Hindu pilgrimage centers in the world. The temple argued the celibate nature of Sabarimala temple's presiding deity Lord Ayyappa was protected by India's Constitution. The top court's verdict is part a string of recent rulings that recognize more rights of women, challenging deeply conservative Indian society. On Thursday, it scrapped a law which did not allow wives to bring criminal charges against adulterous husbands. Chief Justice Dipak Misra in part of Friday's judgment said devotion could not be discriminatory and a patriarchal notion could not trump equality in devotion. "Religion cannot be the cover to deny women the right to worship. To treat women as children of a lesser God is to blink at constitutional morality," he said. Rahul Eswaran, an attorney for the temple, said its management would seek a review of the court's decision. It noted girls and women of other ages were allowed in the temple without restrictions. Chhavi Methi, a women's rights activist, hailed the court verdict, but said its acceptance by temple authorities remained to be seen. "I am doubtful the temple authorities would take it in the right spirit. Women would accept it, but its implementation might pose a problem," she said. The country's secular courts have been intervening recently in cases where a religion's gender beliefs were seen as discriminatory.